Converse UK Size 6.5 Green (Converse With Lunarlon). Dark Green Suede. Black laces in shoes. Brand new, never been worn but do not have box. Comes with spare white laces. Got did of box because I thought I would wear them but a year later I haven’t so selling them to give someone else the chance to wear them. From a smoke free and pet free house. Mail with any questions. Dispatched with Royal Mail 2nd Class. CONVERSE CHUCK TAYLOR 70 HI GORE-TEX. A black midsole forms the underfoot and is cushioned with the OrthoLite® insole to ensure long-lasting comfort. - High Foxing Tape. Mens Converse Jack Purcell UK Size 8 / EUR 42.5. Worn very little but had an unsuccessful attempt at cleaning them so this is my reason for selling. CONVERSE CHUCK TAYLOR 70 HI GORE-TEX. Built with a water-repellent Gore-Tex upper to keep feet dry and protected in wet weather, an OrthoLite® insole provides a cushioned feel with every step. (END Clothing). Converse Chuck Taylors. Colour Blue Coast. CONVERSE ALL STARS, WHITE LACE -UP FLATS, SIZE 7.. Size uk 10, EU 44. On the rear of the shoe there is the All-Star label. The shoes are in almost new condition. The footwear’s black upper and white outer collar in hairy suede reflect yin and yang while accentuating all the recognizable features of the classic One Star. The sneakers also include cotton laces in vanilla and black. 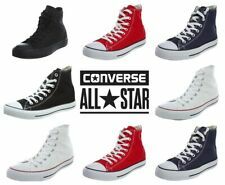 CONVERSE.BLACK HI-TOP TRAINERS. SZ 11 UK.45 EU. mens khaki converse trainers worn size 9 black star on side. leather look. Condition is Used. Dispatched with Royal Mail 2nd Class. Boys Mens Beige/khaki Converse Pumps Size 7 Eur 40. These are slip-on with elastic so no laces. They are distressed with some imperfections as shown in photos. Condition is Used. Dispatched with Royal Mail 2nd Class. 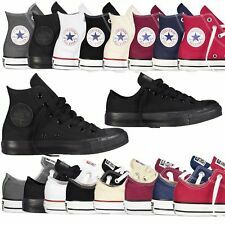 Converse Chuck Taylor All Star Hi 70's Poppy Red Black Team Wool. Condition is New with box. Tattoos aren't just skin deep with these Chuck Taylor All Star canvas high tops. Classic Converse baseball style trainers in a vibrant red featuring a chinese tattoo pattern on a faux silk outer. > Converse Chuck Taylor All Star > Canvas hi top trainers > UK size 7 > Chinese style tattoo pattern > Faux silk outer > Made in China > Extra pair a white lace included > Original box and wrap included These trainers have been used, but are in excellent condition. Please note there are scuffs and marks on each trainer due to wear. Sold as seen. Mens Joker Converse High Tops Uk Size 10. Condition is Used. Dispatched with Royal Mail 2nd Class. 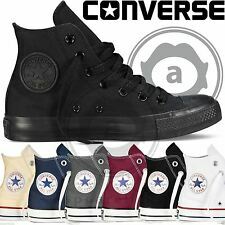 Mens Converse High Tops size 10 New. RRP £65. Condition is New in a box ( not original). Dispatched with Royal Mail 2nd Class. Please check out my other great items for sale! Converse Allstar Boots Black Size 8.5. Suede top cap and black converse symbol Leather upper man-made sole In good used condition Dispatched with Royal Mail 2nd Class. Converse X Comme des Garcon Chuck Taylor Low Khaki UK 8 CDG DSM BNIB. Condition is New with box. Dispatched with Royal Mail Signed For® 2nd Class. In most cases, we can find a swift solution for your problem. sorry after 48 hours I will cancel order. Converse Trainers Men’s Uk 8 Eu 42 Faded Blue High Tops All Star Rare. Very good used Condition. see photos A timeless classic from smoke and pet free home. converse box included. Dispatched with Royal Mail Signed For® 2nd Class. Converse Chuck Taylor Low Top Men's UK 8 1/2 eu 42 USA flag Stars And stripes. Condition is Used but quite clean with very little wear. Dispatched with Royal Mail 2nd Class. Mens Leather Converse Jack Purcell UK 8 Vintage. Condition is Used. Dispatched with Royal Mail 2nd Class signed for service. No box. Shoe trees not included. Note this item is USED so bear this in mind when bidding! You are not buying new! Photos reflect condition. Any questions, please ask before bidding! Having a bit of a clear-out. Please see my other items. No negative or zero-feedback bidders please. PayPal only and within 24 hours of the auction's end, otherwise items will be re-listed. No collection available. Cheers. Converse Chuck Taylor 1970's. USA: 15 GBP. Very good conditions. converse high tops Size 8 Mens. rubber material making it a perfect waterproof boot. Lace ups through the front. condition is used but excellent condition. from smoke and pet free home. Dispatched with Royal Mail 2nd Class. Converse trainers size 11 UK navy blue low tops . Dispatched with Royal Mail 1st Class, tracked delivery. My OH has wide feet, so these were too tight around his toes, not recommended for those with wide feet. Otherwise not even been walked in and are a good price for a new pair of trainers. 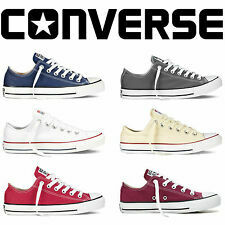 Grab a cheap pair of Converse All Star Trainers UK 11. They are new, only tried on. Bought online from Ebay but they are too narrow for intended individual. I am not an expert and can't comment on authenticity but they were advertised as converse. Converse All Star Rare Red Chuck Taylor. Interior length is 24cm. Rare, Rubber, High Top Logo PrintTrainers. Limited Edition (Product Red). Very very small signs of wear. converse size 7 mens. Condition is New with box. Dispatched with Royal Mail 2nd Class. CONVERSE TRAINERS SIZE8.5 NEARLY BRAND NEW. Condition is Used. Dispatched with Royal Mail Signed For® 2nd Class. THEY ARE IN VERY GOOD CONDITION. THEY HAVE 2 SLIGHT MARKS ON THE OUTSIDE OF THE LEFT TRAINER (SEE PICTURES) BUT THIS DOESN'T AFFECTTHE QUALITY. New with Defects. See below for more info. MEN'S WHITE LEATHER CONVERSE ALL STAR LOW TOP TRAINERS SIZE UK 9 (EU 42.5) VGC. Condition is Used. Dispatched with Royal Mail 2nd Class Signed For.